IRVING, Texas – The Dallas Cowboys picked up a much-needed win on Thursday, but it seems like it comes with a price. Today, the Cowboys learned running back Lance Dunbar, who had a career-high 82 rushing yards in Thursday’s win over the Raiders, will likely be out for the season with a knee injury. Dunbar is expected to undergo surgery on his left knee. The official injury diagnosis is a posterior lateral corner (Posterolateral Corner) that needs to be repaired. The loss is a big setback considering how much of a spark Dunbar gave the Dallas Cowboys in their 31-24 Thanksgiving Day win over the Oakland Raiders. While DeMarco Murray found the end zone three times on the ground, it was Dunbar who gave the Cowboys’ offense a much-needed jolt. Dunbar had 12 carries for 82 yards, including a 45-yard run that set up a touchdown. But late in the fourth quarter, with the Cowboys trying to grind out the clock, Dunbar was hit in the backfield by a blitzing Raiders cornerback. The second-year running back from North Texas went down immediately holding his left knee. He eventually got up and gingerly walked off the field. After the game, both owner Jerry Jones and head coach Jason Garrett described it as a hyper-extended left knee. Dunbar said he expected to be “all right” and sounded optimistic for his chances of playing in the next game against Chicago on Dec. 9. However, today’s MRI revealed more than just a hyper-extension. Without Dunbar, the Cowboys will likely call on either rookie Joseph Randle or Phillip Tanner to rotate with Murray. Before Thursday’s game, Dunbar hadn’t received more than five carries in a game this year. He had three carries for 20 yards the week before in New York and figured to have an increased role in the offense. That carried over into Thursday’s game, where Dunbar also had a reception for 12 yards. This injury is just the latest setback for Dunbar, who has had untimely injuries this year. He suffered a foot injury in preseason that sidelined him for Week 1 against the Giants. When he came back in Week 2, he lost a fumble against the Chiefs, which likely kept him from getting extended carries and touches in the later weeks. He suffered a hamstring injury the week before the Redskins game, where Murray also got hurt. So instead of getting his chance to start with Murray out, Dunbar also sat out the same two games. But that gave Randle a chance to play, which is something he’ll likely be asked to do more in the final month of the season now. This article is part of a series. 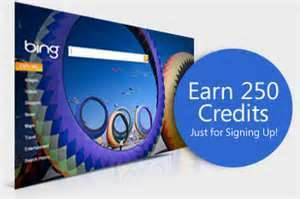 To see all related posts, click HERE. Enjoy! It’s no surprise that Jason Witten continues to play at the level that he has. Despite all the battles that this veteran has seen, there still is that skill when it comes to route running and securing the ball when it is thrown in his direction. What all these seasons in the league has done for Witten, it has allowed him to become crafty of a player. When it comes to the ins and outs of offensive football, Jason Witten would be that guy to ask. He has such an outstanding working knowledge of what teams are trying to do to him and how he needs to combat them. Jason Garrett has told us many times, there is nothing new of Witten having to fight through these defensive schemes that are trying to take him out of the game. Where Witten has been at his best, is when he does get those opportunities to work against single coverage and find that space. These offensive coaches, are working the ball to Witten in the red zone. It’s never a bad situation to put your best player in when it comes to catching the ball in tight spaces. Jason Witten has proven, he can consistently deliver in that role, which he has all season. Offensive coaches need to get James Hanna more involved in the offense but doesn’t appear that will be the case. Like Lance Dunbar, there are things that Hanna can do to help this offense in the passing game. For example, more routes up the field, instead of those chances that he just gets in the flat. If Hanna is not going to be used in the passing game, then expect more from him at the point of attack in the running game. On DeMarco Murray’s 35-yard run against the Saints, Hanna had an outstanding kick-out block on Kenny Vacarro that allowed Murray to sneak inside of him. Jason Witten sealed the edge that got Murray to the 2nd level and off to the races. Where Hanna has had his struggles is when he hasn’t been as powerful as he needed to be and he gets compressed into the backfield causing the ball to be stopped for no gain or even for a loss. Where this offense needs to take advantage of Hanna is allowing him to block on the move like he did in the Saints game. He is a much better player when he can attack a defense this way because of his athletic ability to stay on his feet and run with his man. Regardless, this offense needs more from James Hanna on the edge. These games down the stretch are going to be tough and tight which requires your players to be at their absolute best when it comes to executing plays. The safest route when trying to control or finish games is how you use your tight ends in certain situations. Despite the fact that we have really only seen Jason Witten as that go to guy. James Hanna and even Gavin Escobar are going to have to make some tough plays down the stretch. All three of these tight ends have the ability to get down the field and secure the ball when it is thrown in their direction. You use your tight ends, when you want to make simple, easy throws. We understand that their “11” and “01” personnel groups might be their best packages when it comes to moving the ball, but there will be a game or two where this “12” personnel group will be the difference in the outcome in the game. There is just too much talent with these tight ends not to fully take advantage of their ability. These final six games will prove that to be the case. IRVING, Texas — The Dallas Cowboys gave wide receiver Miles Austin a day off today to make sure he is closer to 100 percent to play Sunday against the Philadelphia Eagles. Austin was on the elliptical machine at the start of practice. He played in Dallas’ win Sunday against the Washington Redskins but did not have a catch after missing two games with a hamstring strain. Running backs DeMarco Murray (knee) and Lance Dunbar (hamstring) are also missing from practice, as is DeMarcus Ware, who has a quadriceps strain that could keep him out Sunday. 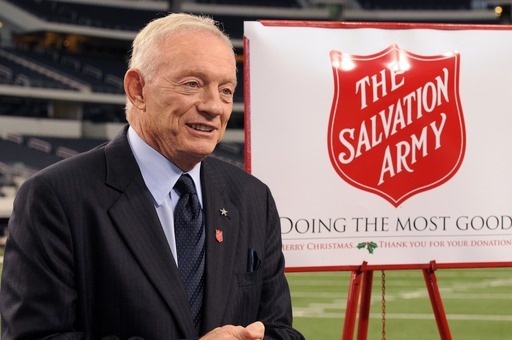 Murray has hopes of playing, but owner and general manager Jerry Jones already ruled him out. Defensive end George Selvie returned to the practice field after he sat out Wednesday’s workout because of a sore shoulder. Linebacker DeVonte Holloman is not practicing because of a neck strain he suffered Wednesday. Defensive end Edgar Jones (groin) is also not at practice. He did not play against Washington. 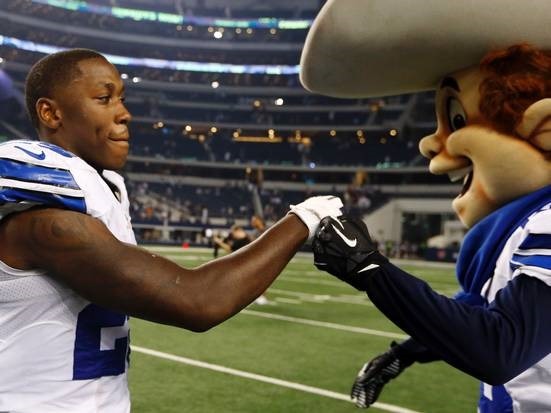 IRVING, Texas – Any doubt about Lance Dunbar’s ability to play this weekend seems to be gone now. The backup running back was a full participant in practice, and he said he’s finally able to do everything he needs to do to suit up on Sundays. Dunbar said earlier in the week he thought he’d still feel the sprain but could play through it. It sounds like he’s gotten past that mental block now. 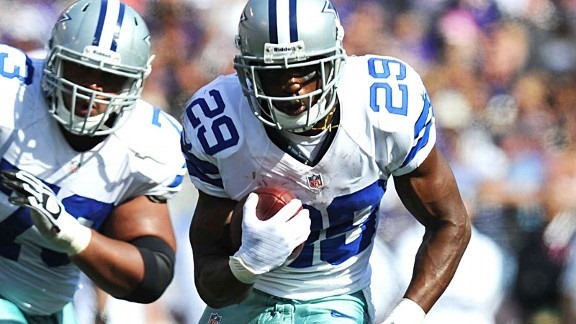 With Dunbar absent last weekend, Murray took 20 of the 21 rushes by the running backs. Phillip Tanner took the other carry for two yards. If the preseason and offseason are any indication, Dunbar will play a more vital role as the Cowboys’ backup running back. He could also be a factor in the return game. Cornerback Morris Claiborne and receiver Cole Beasley returned to practice with the season opener 13 days away, but guard Mackenzy Bernadeau and defensive tackle Jason Hatcher stayed in as the Cowboys began the final week of preseason. Claiborne’s final chance to play in the preseason is Thursday in the finale against the Houston Texans. He has not played in a game because of a “jammed” knee he suffered in training camp on Aug. 6. Beasley hurt an ankle in the preseason game against Oakland on Aug. 9. Bernadeau, who played left guard Saturday against the Bengals, has an ankle injury. He and Hatcher rode the exercise bike as practice began Monday. Guard Ronald Leary also did not make it out for the start of practice. Leary is recovering from knee surgery less than two weeks ago. Also not out for the start of practice were linebacker Brandon Magee (concussion), safeties Matt Johnson, Eric Frampton and Danny McCray, defensive linemen Anthony Spencer and Jay Ratliff, running back Lance Dunbar and center Ryan Cook. IRVING, Texas – None of the defensive players who were inactive for Saturday’s preseason game returned to practice Monday at Valley Ranch, while the offense received a mixed bag of news. Guards Kevin Kowalski and Ray Dominguez returned from knee and shoulder injuries, respectively, but running back Lance Dunbar missed practice for the first time with a foot sprain. Five offensive players were out Monday, including Dunbar, wide receiver Cole Beasley (foot) and offensive linemen Ryan Cook (back), Ron Leary (knee) and Nate Livings (knee). Leary and Livings are both on the mend from knee scopes. Safety Matt Johnson (foot) thought he’d be able to return in some capacity Monday, but he wasn’t on the field during the early portion of practice available to the media. Morris Claiborne, whose day-to-day knee injury has now become week-to-week, was also out. Some good news for the defense was the return of safety Will Allen, who left Saturday’s game after injuring his ribs. Head coach Jason Garrett said after the game the injury wasn’t serious and he could have returned. The usual suspects were still out on defense, including Anthony Spencer (knee) and Jay Ratliff(hamstring), while Ernie Sims, Sean Lissemore and Eric Frampton are all still recovering from injuries suffered toward the end of camp. J.J. Wilcox hasn’t returned yet for personal reasons, but has been given as much time as he needs following the death of his mother and is expected back around the middle of this week. Travis Chappelear and Toby Jackson weren’t at practice for the beginning portion, either. Chappelear wore a boot as he left the field Saturday. 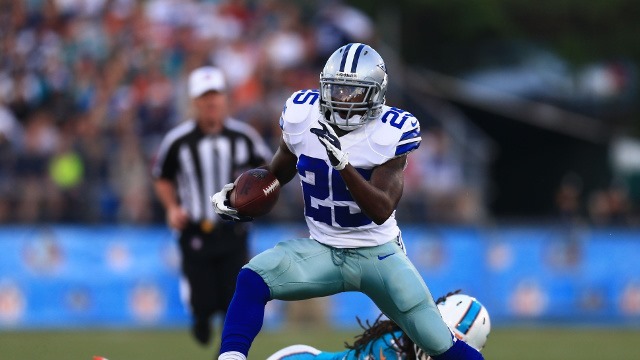 IRVING, Texas – The Dallas Cowboys’ offense loses some “juice” with scatback Lance Dunbar sidelined by a sprained foot. That’s the term coach Jason Garrett and quarterback Tony Romo use to describe Dunbar’s dynamic quickness and explosiveness. It’s what makes Dunbar, a second-year player who was undrafted out of North Texas, unique among the four running backs likely to make the Cowboys’ roster. Never mind the unimpressive numbers from Dunbar’s rookie season, when he gained 75 yards on 21 carries and caught six passes for 33 yards. He had carved out a significant role as a change-of-pace and third-down back behind DeMarco Murray. 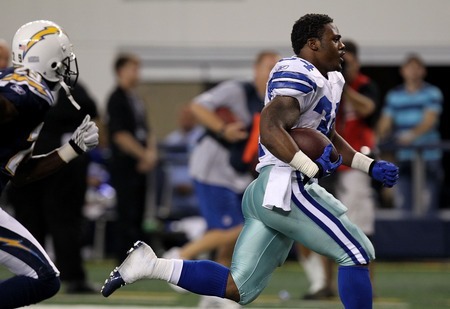 The Cowboys envision Dunbar as their version of Darren Sproles, the New Orleans Saints’ undersized spark plug. They are especially enamored by his receiving skills and ability to make plays in space, a couple of attributes Dunbar displayed on his 43-yard catch-and-run that unfortunately ended with a fumble inside the Arizona 5 in Saturday’s preseason loss. That will be the last fans see of Dunbar making plays for at least three or four weeks. The season opener against the New York Giants is scheduled for three weeks and a day after Dunbar suffered the injury. Murray missed six games with a sprained foot last season. If Dunbar takes that long to recover, he’s in jeopardy of missing the first three or four games of the season. A sprained foot is especially a concern for a player whose best trait is his quickness. The Cowboys can only hope that Dunbar recovers quickly and brings the juice when he comes back. 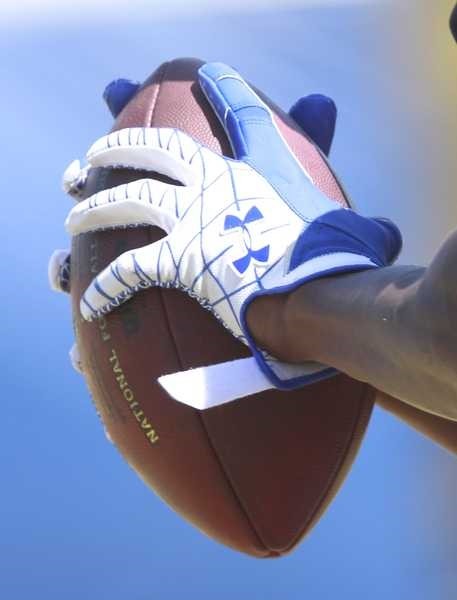 • Hope you had a chance to catch the TRAINING CAMP ON-DEMAND segment from Tuesday where we featured the one-on-one drills with the wide receivers and cornerbacks. If you did, you saw a show from Dez Bryant. Through three days of camp, this is not unusual for Bryant, who has been nothing short of spectacular in the manner in which he has gone about his business. The route running along with the sheer physical strength that he has played with has made him difficult to defend. In our video, he was matched against Morris Claiborne on each one of his reps, and, to Mo’s credit, he didn’t take himself out or away from working against Bryant. Every rep that the two went at each other was intense, where technique went out the window and it came down to the sheer will of who was going to make the play. When you are battling Bryant, you might be in position in the route like Mo was several times but just his ability to adjust while in route makes him so dangerous. It wasn’t that Claiborne was struggling to fight Bryant, but more like Bryant can physically beat you up as he is going down the field, then find the ball no matter where it is in the air and this is something that NFL cornerbacks are going to have to deal with when they line up across from Bryant the entire season. • Continuing my thoughts on Morris Claiborne, I was very interested to see how he would respond to playing against the run in this new scheme off the edge, especially with pads on. I have addressed this situation plenty with both he and Brandon Carr on what is expected of them on the outside. From my observations, there were several plays where the ball was spilled to the outside and Claiborne had to step up and make the play. Like his battles with Bryant, he could shy away and hide but instead he stepped up and forced DeMarco Murray to the sidelines and out of bounds when Murray tried to plant a stiff arm in his face. Later in the Team Run period, he again stepped up off the edge playing close in a tight formation and handled Lance Dunbar for a short gain in the open field. 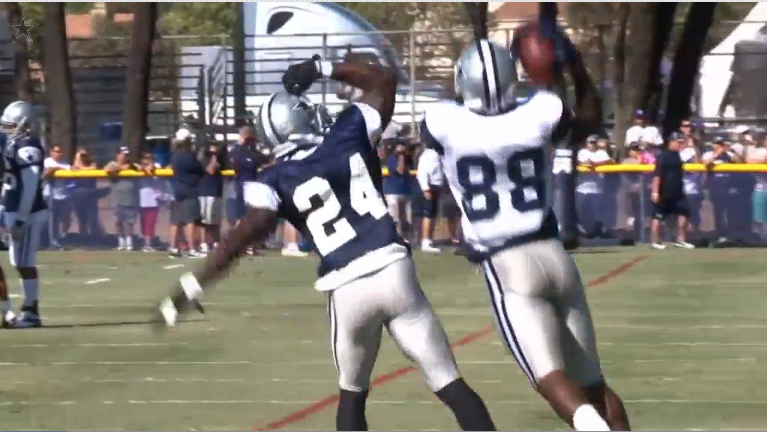 For Claiborne, this has now become his responsibility full-time because soft corners don’t win in this scheme. The physical matchups against Bryant and having to successfully play the run are part of the gig. His first day in the pads showed that he understands the task ahead. • Another player who is off to a nice start in camp is Doug Free. In the first day of pads, I thought he did a nice job of showing up and handling the position with some nice technique. In just watching him play, you can see that his confidence level is much better as well. With each rep, he has been on point with how his hands and feet have to work together. His sets have put him in positions where he looks stable and solid. I have yet to see the problems he has struggled with when a defender goes from speed to power on him. He is playing stronger at the point and when he has to sit down on a rusher, he has been able to do so without giving much ground. In the running game, he has shown the ability to adjust in this zone scheme with the front side reach and backside cut off. When the ball has been run to his side, he is not late or struggling with his technique. He has played with good quickness and has been able to finish his blocks or tie up his man. Still plenty of practices to go for Free, but so far he is heading in the right direction. • It was a good learning experience for Barry Church on Tuesday on how to play safety as the single high guy in this scheme. In the 7-on-7 drill, Church was in the middle of the field when Dez Bryant went on a “9” route against Brandon Carr up the field. Church reacted well to the route to help Carr but the angle he took to the ball was too deep and behind Bryant who once again went straight up for the ball at its highest point. Bryant was able to make the catch but Church would have had a shot at the play if his angle was more to or in front of Bryant, instead he goes sweeping by him with no chance at the ball. On Monday, we observed Will Allen playing the same route to Miles Austin correctly and in position for the interception. Later in the period, Church was able to show a nice drive and reaction to a ball that was thrown in front of him to Gavin Escobar up the field to deliver a big hit on the rookie tight end. For Barry Church, every day is a new experience when it comes to techniques that he is going to have to learn coverage-wise. He has the physical ability to handle the job but he just needs the experience of reading and positioning himself in routes to make those necessary plays. 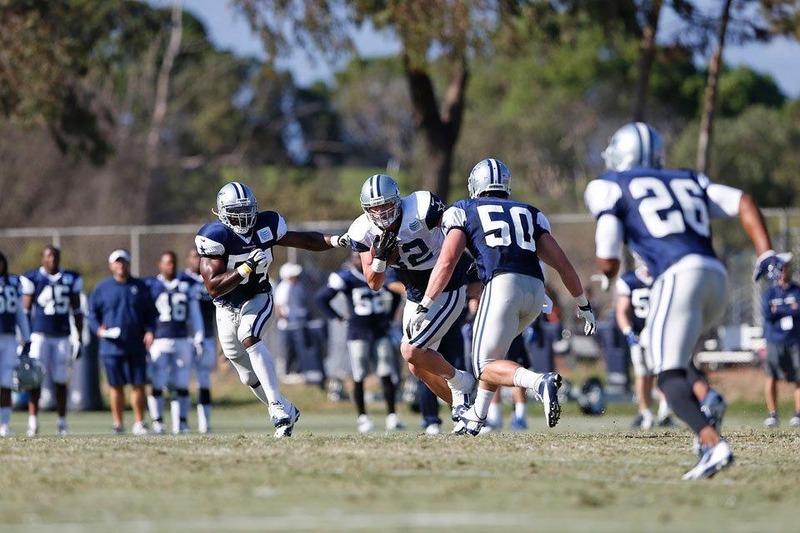 IRVING – Dallas Cowboys running backs coach Gary Brown likes the players he’s tutoring. But being a fan of his backs doesn’t necessarily mean Brown is on the same page with them when it comes to their running styles. For instance, he and Murray differ over the controversial crown-of-helmet rule the NFL Competition Committee passed in March. 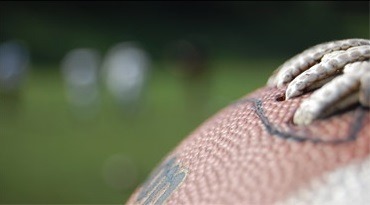 The new rule, designed to make the game safer, penalizes players for lowering the crown of their helmet outside the tackle box. While Romo’s six-year, $108 million contract extension gives him the funds to cover his teammates’ fines for the rest of their careers, Brown is hopeful the quarterback won’t have to dig into his pockets to bail out Murray. Asked about Murray’s penchant for seeking contact, Brown said last week, “I noticed that. I’ve seen that. We’ve talked about it. We are going to have a plan to try to get better than that. He’s explosive enough that he can freeze people’s feet and get away from them and do the things he needs to do to gain more yards. Brown, a former Houston Oilers running back who joined Dallas after it fired Skip Peete in January, actually likes the rule and thinks it will benefit Murray. But it’s the safety aspect of the rule Brown likes best. Injuries have been an issue for the 6-foot, 215-pound Murray ever since Dallas drafted him in the third round in 2011. The Oklahoma-ex missed three games his rookie year and six in 2012 but still managed to lead the club in rushing both seasons (897 yards in 2011, 663 in 2012). While Brown said he’s powerless to prevent the ankle and foot issues that have plagued Murray, he’s certain the new rule will help prevent catastrophic injuries. Dallas Cowboys head coach Jason Garrett suggested the club must walk a fine line when tinkering with Murray’s style. “One of the things we like about him is he finishes runs,” Garrett said of Murray. “You think it might be blocked for three or four yards and he makes five or six because of how he finishes. IRVING – With 1,265 rushing yards last season, the Cowboys ranked next to last in the NFL and established a franchise low for a 16-game season. New running backs coach Gary Brown, though, is optimistic there will be improvement this season with a healthier DeMarco Murray, the addition of fifth-round pick Joseph Randle and some new blocking schemes. Murray has missed nine games due to injuries the last two seasons, so Brown has his fingers crossed that the Oklahoma-ex in 2013 will finally put in a full season. Brown is a big fan of Randle, who was limited at rookie minicamp because of a cast to protect his injured thumb. Speaking of Houston, the Cowboys plan to take a page out of the Texans’ playbook and run more zone blocking schemes. “We feel like we have players that can run it, blocking that can do it, so we are going to emphasize it and get better at it,” Brown said. ARLINGTON, Texas – Think about the 83 yards Dallas Cowboys running back DeMarco Murray gained. The four catches for 19 yards also mattered. So does the touchdown he scored. Beyond that, Murray’s impact is bigger than any stat you want to discuss after the Dallas Cowboys beat the Philadelphia Eagles, 38-33, on Sunday night. He gives the Cowboys a toughness and a physical mentality they lack when he’s not in the lineup. Murray is the reason Tony Romo had his best game, passing for 303 yards with three touchdowns and no interceptions. Murray is the reason Jason Garrett didn’t abandon the run with the Cowboys trailing by a touchdown at halftime like he usually does. He’s the reason offensive line coach Bill Callahan was laughing and joking with all of his starters after the game. And he’s the reason why more than one lineman talked about Garrett’s commitment to running the ball the entire game. Murray missed the past six games with a sprained foot, and that’s the biggest reason the Cowboys entered the game ranked last in the NFL in rushing (78.7 yards) and attempts (22.0). They ranked 31st in average per carry (3.55) and hadn’t had a run of more than 20 yards in 166 carries. Just so you know, they also ranked last in first-down rushing (3.45), which meant Romo and Garrett usually found themselves in second-and-long. Here’s the deal: No team can consistently win — even in today’s NFL — throwing the ball 68 percent of the time, which is what the Cowboys did in their first 11 games. The six-game absence was also difficult for Murray, who watched the Cowboys lose three of six games without him. "I thought I was going to play against Washington, but it was a short week and the training staff just wanted to be careful," Murray said. Against the Eagles, the Cowboys ran 33 times and passed 27 times. It’s the first time Garrett has called more runs than passes since the Cowboys ran the ball 42 times for 227 yards against Baltimore, when Murray hurt his foot. "Once I got out there and adrenaline started rushing, I felt good. It’s not there where I’m 100 percent. There were a couple times it got tweaked and I definitely felt it, but after a few minutes it goes away. Murray ripped off a 14-yard run on his first carry, and Philadelphia never really slowed him down enough to discourage Garrett from giving him the ball. Murray had only 35 yards on nine carries in the first half. But Murray gave Garrett every incentive to keep giving him the ball on the first possession of the third quarter. With Dallas trailing 17-10, Murray gained 13 yards on the quarter’s first play. On third-and-1 from the Dallas 42, Murray bounced an inside run around the right end and gained 27 yards yards to the Philadelphia 31. It was only the Cowboys’ fourth run of more than 20 yards this season. Three plays later, Dez Bryant’s 23-yard catch-and-run tied the score at 17-17. "I was off a little bit," Murray said. "There were some runs I felt good and some I knew I had been out for six weeks." 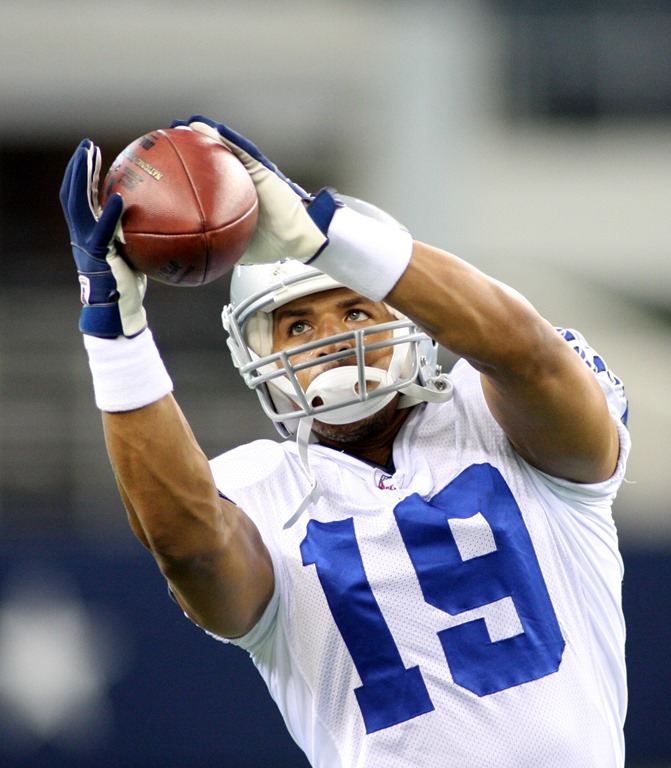 Miles Austin scored on a 27-yard touchdown pass set up by a run-fake to Murray. Jason Witten had six catches for 108 yards and his first two catches of more than 20 yards in four games. Bryant had 98 yards receiving and two touchdowns. Murray created all of that. Every bit. That’s the kind of balance Garrett wants on offense. Now, he just needs Murray on the field for the last four games. DALLAS — Jason Witten shows up at the Salvation Army every year to serve an early Thanksgiving lunch. On Tuesday, he brought his buddy with him. Quarterback Tony Romo was one of the 12 Cowboys veterans who worked the food line and brought plates out to the clients at the Salvation Army’s Collins Social Services Center in Dallas. It’s part of the kickoff to the team’s annual Thanksgiving holiday drive for the charity. In Fort Worth, another group of players and cheerleaders served a Thanksgiving lunch to Salvation Army residents there. Romo doesn’t make a lot of public appearances, so it was a treat for the lunchtime crowd and the hosts. The Salvation Army staffer who introduced him — a Cowboys fan since she was 10 years old despite growing up in Washington, D.C. — couldn’t resist calling him over and saying, to cheers, "This is the first time I’ve met Tony Romo. I’m standing by Tony Romo!" Witten got a grin out of it. "He does a good job of seeing those fans, and obviously, they have words of encouragement or, sometimes, advice — for all of us, and especially the quarterback," Witten said, drawing a laugh. Parenthood, said Witten, has affected Romo’s outlook. "Being a father himself and a family guy, it does provide a perspective," he said. "It’s unbelievable how good his motives are. He just wants to spend time with them and stay away from all the other stuff. That’s what it’s all about, to come here and get the impact, more than anything else." Romo stayed in the kitchen for the most part, but he took charge there, too. He put Miles Austin on dressing, put himself on rolls. "He was on the rolls, but you know what? It was a little hot back there," Witten said. "He did provide some entertainment for the staff. Those are stories those people will be able to tell for a long time, getting to work with Tony in the back. He didn’t quite have it mastered like they did." Other players who participated included DeMarcus Ware, Miles Austin, DeMarco Murray, Phillip Tanner, Kyle Orton, Robert Calloway, Derrick Dockery, Eric Frampton, Orlando Scandrick and Brandon Carr. Murray, who has missed four games with a sprained foot, said it lifted his spirits to do his part. "Getting away from everything that deals with football, enjoying life, giving back, being around people who really don’t see football, it was nice to come out here and give," he said. Sherby Nixon shows rookie Cowboys linebacker Kyle Wilber, left, and running back Lance Dunbar how to prepare a thanksgiving lunch plate. 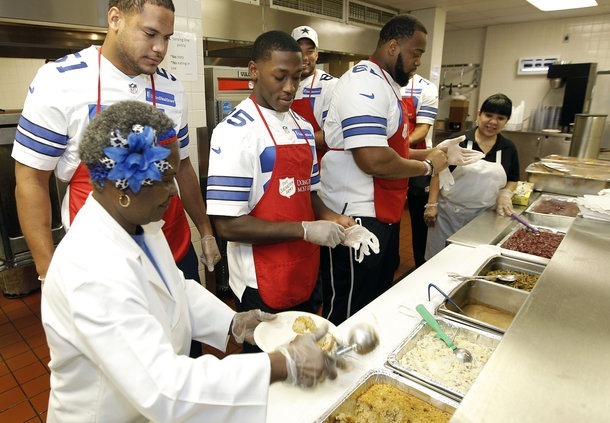 DALLAS – The Cowboys have a couple of Thanksgiving traditions: Playing football on Turkey Day and serving meals to the less fortunate earlier in the month. Tuesday was the day for the latter tradition. The Cowboys manned two Salvation Army locations, with the rookies serving meals in Fort Worth and a group of veterans serving meals in Dallas. It’s not just about serving meals. 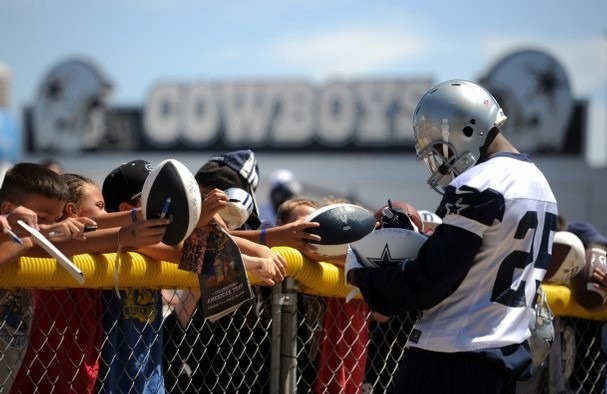 The Cowboys sign autographs and interact with people who generally need some good vibes. ATLANTA — The season is now in jeopardy for the Dallas Cowboys. They came here trying to knock off the undefeated Atlanta Falcons but failed, 19-13, at the Georgia Dome on Sunday night. The Cowboys have now lost eight consecutive games on Sunday night and are 3-5 overall at the halfway point of the season. The Falcons improved to a perfect 8-0. What it means: The Cowboys are two games under .500 and most likely will have to win seven of the next eight to get into the playoffs. If the Cowboys win six of the next eight, they might need some help to reach the postseason. Scandrick with some gaffes: Slot cornerback Orlando Scandrick struggled in the fourth quarter against the Falcons. He missed a tackle on a 31-yard run play by Michael Turner on a third-and-6, then was flagged for defensive holding on a third-and-8 play against Roddy White. Both plays extended the last drive of the night for the Falcons. It’s these kinds of plays that Scandrick has to make, especially with the game on the line. Running back rotation: Felix Jones started, but Lance Dunbar (North Texas) got a majority of the snaps as the backup instead of Phillip Tanner. For the game, the Cowboys rushed for 65 yards on 18 carries. Jones had 39 yards on nine carries and Dunbar, on eight carries, picked up 26 yards. It’s clear the Cowboys miss starting running back DeMarco Murray, who was out with a sprained foot. His return for the Philadelphia Eagles game next week is a possibility. Witten makes Cowboys history: Coming into the game, tight end Jason Witten needed three catches to tie Michael Irvin as the franchise’s all-time leader in receptions. Witten finished with seven catches for 51 yards. But once again, he had no touchdowns. No Bryant in second half: Dez Bryant started despite a sore hip and finished with one catch for 15 yards, none in the second half. Quarterback Tony Romo didn’t target him in the second half. Instead, Miles Austin and Kevin Ogletree were the main targets, along with Witten. 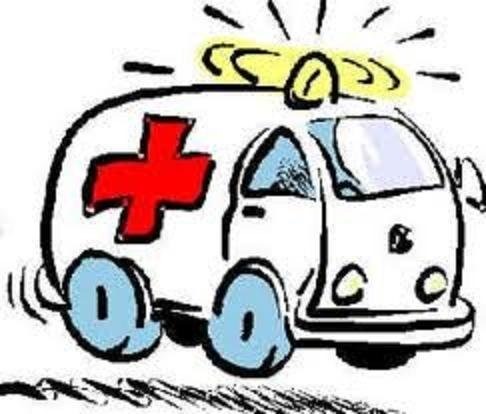 Ratliff plays hurt: Nose tackle Jay Ratliff hurt his left ankle late in the first half. While he didn’t start the second half, he played through the injury. There were no other major injuries for the Cowboys. Who’s next? The Cowboys finish their toughest stretch of the season (four of five on the road) with a trip to see the Eagles on Sunday. IRVING, Texas – The Atlanta Falcons are the only undefeated team left in the NFL. But don’t think that makes them unbeatable. In fact, of their seven wins, only one has come against a team (Broncos 4-3) that currently has a winning record. There was also a three-week stretch in which the Falcons narrowly won games against less than stellar teams. In week four, the Falcons beat the Carolina Panthers 30-28 on a last second field goal. In week five, the Falcons beat the Washington Redskins (who played the end of the game without Robert Griffin III) 24-17. In week six, the Falcons beat the Oakland Raiders 23-20 at home. A win is a win in the National Football League, so the point is not to fault the Falcons, but to look to these three games for a formula to beat Atlanta. And after taking a second look at all three games the verdict might not bode well for the Cowboys. These three teams had success against the Falcons by effectively running the ball. The Cowboys’ offense looked great against the Giants in the second half as they all but abandoned the run game. Don’t expect that to be the most effective strategy against the Atlanta Flacons. It’s no secret that the Falcons are a big-play, quick-strike offense. With Tony Gonzalez, Roddy White, and Julio Jones, they have three players that average over 10 yards per carry and they have 13 touchdowns between them. Not to mention that Matt Ryan is playing at an elite level. Teams’ only sustained success this year against the Falcons has been by running the ball and keeping Ryan and the offense off of the field. The Falcons have the 26th ranked rushing defense in the NFL. In their loss to the Falcons, the Panthers rushed for 199 yards. Perhaps more importantly, they ran the ball 35 times versus just 25 passing plays. Ryan still played quite efficiently, but Carolina controlled the tempo for most of the game meaning the Falcons’ offense had more pressure to rely on the big plays of their offense (which they happened to get just enough of to win). Ironically, it was a Panthers fumble in the last moments of the game that forced them to punt it to the Falcons who drove from their own 1-yard line to hit a game-winning field goal. The Redskins managed to hang with the Falcons despite losing Robert Griffin III in the third quarter to a concussion. They did so with a game plan that relied heavily on running back Alfred Morris who got 115 yards off of 18 carries. The predictability of Atlanta’s offense was apparent as Matt Ryan threw the ball 52 times in order for the Falcons to reach 24 points. Perhaps with Griffin playing the fourth quarter the Redskins could have continued the success of their ground attack and limited the opportunities for Ryan’s passing plays. The next week the Oakland Raiders nearly beat the Falcons by dominating the time of possession. The Raiders ran for 149 yards compared to just 45 from the Falcons. The Falcons once again relied on big plays from their wide receivers, but this time it cost them as Ryan threw three interceptions almost costing the Falcons a win. Like the Panthers and Redskins before them the Raiders played kept a very balanced blend of running and passing the ball. They threw the ball 33 times to go along with 32 running plays. Atlanta made just enough big plays to sneak out a 3-point victory. What we can take from all of this is relatively obvious; the Falcons rely heavily on the expectation that their receiving threats (mainly Gonzalez, Jones and White) will make enough game-changing plays for them to win. Those players are talented enough for that to be a logical strategy. But no matter how talented your players are, such plays are rarely a given. You can’t just expect to convert every time you throw it deep to your Pro-Bowl receiver. But the Falcons take so many shots that they typically convert enough to win games. These three teams had success against the Falcons by limiting the amount of shots they could take at big plays. In a sense they gambled that when it came down to crunch time they would be able to prevent the big passing plays. Even though they were wrong, they kept themselves in the game until the final moments. I think that the Falcons have a clear weakness at running back and it has yet to be fully exposed. 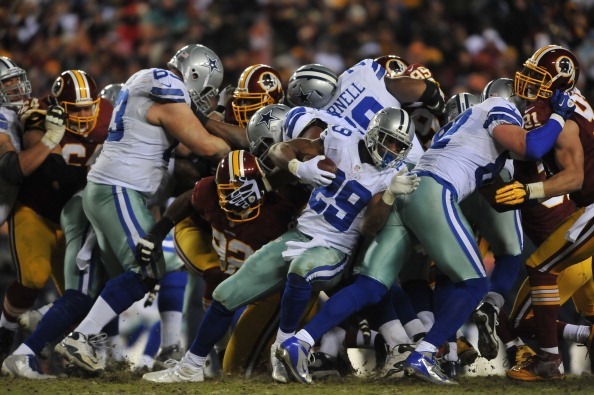 The Cowboys’ reluctance to run the ball has been well documented as they have only rushed the ball 24.1 times per game. But the Falcons are actually right behind them at 25.1 times per game. The Cowboys and Falcons have shared many of the same weaknesses and their strengths lie in some of the same places. But considering how effective the Falcons have been this season compared to the Cowboys it might not be wise to go head to head with them on their strengths. In other words, the Cowboys don’t want to try to get into a shoot out with the Falcons. Both teams have great weapons on offense, but the Falcons have been much more successful taking advantage of their weapons and winning games off of passing situations. Compared to their 26th ranked rush defense, the Falcons have the 10th ranked passing defense. Their secondary is a big step up from the Giants’ secondary that the Cowboys passed all over in the second half of last Sunday. There may be little reason to have faith in the performance of Felix Jones (who is not 100 percent), or Phillip Tanner or Lance Dunbar for that matter. But beating the Falcons will likely require a commitment to the running game. Both teams will likely make big plays in the passing game. But Sunday’s game might come down to who can control the game in between those big plays. If the Cowboys fall behind by a touchdown early in the game, handing the ball off to Felix Jones and controlling the clock might not be the most popular decision, but that type of discipline and faith in the running game could be what it takes to take down a team like Atlanta. The Dallas Cowboys had three receivers top 100 yards tonight (Jason Witten, 167; Miles Austin, 133; and Dez Bryant ,110) for just the second time in franchise history. The first was at San Francisco (11/10/63) as Frank Clarke (190), Lee Folkins (112) and Billy Howton (107) were the first Cowboys trio to accomplish the feat. Austin’s nine catches today upped his career total to 245 to pass Kelvin Martin (237) for 13th in franchise history. Austin’s 133 yards today upped his career total to 3,855 to pass Doug Cosbie (3,728) for seventh in team history. Dez Bryant finished third on the team in both receptions (five) and yards (110) today. His 110 yards marked a career-high, his second 100-yard game of the season and the third of his career. Bryant upped his career receptions total to 149 to pass Don Perkins (146) for 29th in team history. Bryant improved his career receiving yards total to 1,977 to pass Timmy Newsome (1,966) for 28th in franchise history. Bryant had a career-long 55-yard catch today. Lance Dunbar had a 44-yard kickoff return today for the longest kickoff return of the season to date. Dwayne Harris tied his career-long punt return of 14 yards today. Felix Jones rushed 13 times for 19 yards and touchdown today. He now has 507 career rushing attempts to become the 12th Dallas Cowboy with 500 rushes. Jones’ rushing touchdown today was the 10th of his career to make him the 18th Dallas Cowboy with 10-or-more rushing scores. Danny McCray picked off his second career pass today. John Phillips notched his second career touchdown reception – the first was also against the N.Y. Giants (12/11/12). Romo’s 437 yards was his second career 400-yard game (first was 406 vs. Tennessee, 10/10/10) and his 34th career outing with 300-or-more passing yards. Romo also rushed for his fifth career touchdown today. DeMarcus Ware’s sack today was his fifth straight game with at least a half sack – the fourth such streak in his career. Ware has 13.5 career sacks against the Giants – the second-most against any team in the league (Philadelphia, 15.5). He also has 13.5 sacks of Eli Manning – more than any other quarterback he has sacked in the league. Witten’s 18 catches tied for the third-most in a game in NFL history (Brandon Marshall, 18, vs. San Diego, 9/15/08) and were the most by a tight end in NFL history. Witten’s 167-yard performance tied for the 20th-best single-game total by a league tight end and was a club tight-end record. Witten also extended his club tight end record of 100-yard outings to 16. Witten upped his season catch total to 51 to give him his ninth career and ninth consecutive season with at least 40 catches. He is now tied with Jeremy Shockey for the third-most 40-plus catch seasons and the third-most consecutive 40-catch seasons among tight ends in NFL history. Witten’s 51 catches thus far also marked his ninth career and ninth consecutive 50-catch season for the second-most by a tight end behind Tony Gonzalez (14 total and 14 consecutive) in NFL history. Witten now has 747 career receptions and trails Michael Irvin by only three for tops in team history. IRVING — Because of injuries to others, Dallas Cowboys running back Phillip Tanner has taken plenty of practice snaps this week with the first-team offense. The second-year back considers himself ready, if needed, to make his first NFL start Sunday against the New York Giants. But the former free agent draws the line at declaring himself comfortable in that role. Or any role in professional football. "I’m never comfortable. That’s what kills you, when a guy gets comfortable and complacent," said Tanner, who had a career-high 13 carries in last week’s 19-14 victory over Carolina in relief of injured teammates DeMarco Murray (foot) and Felix Jones (knee). "I still come in every day as if I’m a free agent trying to make this team. I study film as if I’ve never seen it before. I take notes as if I’ve never read it before. Just so I can stay on my toes and won’t become complacent …So if I was good at 13 carries, I’ll try to be better at 14. And on and on and on." That work ethic, coach Jason Garrett said, offers comfort to the Cowboys if Tanner — a third-teamer with 44 career carries for 137 yards — handles most of the workload Sunday against the Giants with Murray out and Jones on the mend. Jones practiced Thursday on a limited basis and, barring a setback, is expected to start Sunday. But if Jones cannot play or cannot finish Sunday’s game, the spotlight shifts to Tanner. And Tanner’s primary backup would be rookie Lance Dunbar, a free-agent signee from North Texas and Haltom High School whose lone NFL carry covered 11 yards in the team’s 31-29 loss at Baltimore on Oct. 14. Dunbar said the undrafted duo can handle a showdown with the reigning world champions, if necessary. "I’m pretty confident in myself and I’m confident in him," Dunbar said. "If that happens, we’ll approach it like, ‘OK, we can do this. It’s just another game.’ We’d play our game and let it happen." And their games differ greatly. Tanner (5-foot-10, 217 pounds) offers a blend of power and speed that teammate Tyrone Crawford likened to Doug Martin, Tampa Bay’s first-round pick in the 2012 NFL Draft. Crawford, a defensive tackle, played at Boise State with Martin and said Tanner "reminds me of Doug [because] they both run low, powerful and with good vision. He’s a smash mouth back with speed and it’s good to have him." Dunbar (5-foot-8, 191 pounds) is more of a breakaway threat who is dangerous in the open field. "His quickness is sick," fullback Lawrence Vickers said. "He’s great with the ball." Regardless of who plays running back against the Giants, the Cowboys seek to match the ground-and-pound production they had in a 24-17 victory over the Giants on Sept. 5 (143 rushing yards, including 131 by Murray) and in their past two games. Dallas rushed for a season-high 227 yards against Baltimore and collected 85 against Carolina while controlling the clock for 33:37. Against the Panthers, Tanner (13 carries, 30 yards) handled the ball seven times in the final 7:32 on drives that resulted in a go-ahead field goal with 3:28 remaining and another to pad the lead with 58 seconds to play. Tanner touched the ball nine times in the fourth quarter (eight carries, one catch), including a 5-yard trap play on third-and-9 that preceded the go-ahead field goal. "He’s on our team for a reason," Garrett said, praising Tanner’s ability to handle a bigger role in an emergency situation. "At every turn [since signing with Dallas], he came in here and said, ‘You are not cutting me from this football team.’ When he’s gotten more opportunities in the preseason or the regular season, he’s shown us he can do a good job for us." Tanner’s biggest opportunity could come Sunday if Jones’ knee ailment elevates Tanner into the starting lineup. It would be a moment the Dallas native, who played at Kimball High School, has envisioned since signing with his hometown NFL team on July 28, 2011. "The most important thing I’ve learned is always be mentally prepared. Just take it to practice every day as if I’m going to be the starting running back," Tanner said. "That’s been my mind-set since the first day. Just to work hard and jell with the offensive line as if I’m the starting running back. So that when my time came, I would be ready." Vickers said the Cowboys’ ground game can be productive Sunday even if it leans on a Tanner-Dunbar tandem against the Super Bowl champs. "Absolutely," Vickers said. "Every back in that backfield is ready to go at all times. We’re preparing to make sure we can be a dominant group and hold up our end on the football field." BALTIMORE — Whatever you do, don’t do that. Whatever the plan, it couldn’t have been that, could it? Excuse both the rant, and the confusion, but 20 seconds, 20 precious seconds, were wasted by the Dallas Cowboys at the end of Sunday’s game, leading to, if nothing else, a flashback to the horror show of clock mismanagement in Arizona last season. That one was Jason Garrett’s worst 2011 head coaching moment, and the lack of accountability in the aftermath still hangs over him. Maybe not so much, which still doesn’t excuse what appeared to be a blunder. In this one, however, at least quarterback Tony Romo and Garrett had the same story, the same explanation on why those 20 precious seconds were left blowing in the Maryland wind. And no, it wasn’t the "plan," both said. As in Arizona, however, the Cowboys ended up losing a winnable game, falling 31-29 to the Ravens, and the lament of "oh-so-close" is becoming more hollow the more the Cowboys blow these kind of heartaches. Always dependable Dan Bailey was a tad wide left on a 51-yard field goal in the final seconds, allowing the Ravens to escape. But with a little less distance to cover with his foot, or with a better placement of the ball — as in between the hash marks — would the outcome have been different for Bailey? Count that as one of a hundred coulda, shoulda, woulda questions the Cowboys had to answer in the aftermath. First of all, they finally got a call, maybe a gift call, in the final minutes from an officiating crew that made the replacement boys look more acceptable with every yellow hanky that fell. After a pass interference flag, the Cowboys had the ball at the Ravens’ 34-yard line with 26 seconds left and one timeout. That has to be two-play territory, right? Heck yes, it’s right. The Cowboys ran one play. Then came the failed kick. What happened after a quick Romo inside throw to Dez Bryant netted only a yard? At that point the clock was running with 20 seconds left when Dez was taken down. "What we were trying to do there is what we talked about before the play," Garrett said. "Tony was trying to get them on the ball as quickly as possible [after the Dez catch] knowing we had one [timeout] in our pocket. "It just took too long for everyone to get unpiled, so it got down into single digits, so we said take it down to four seconds and bang the timeout." Obviously, it’s up to the Cowboys to get "unpiled." The unpiling was not quick enough. But was there also clock panic? It sure looked like it. Romo: "With the time left, we didn’t think it was in our best interest to run another play. We had guys who needed to get off the pile and receivers who needed to come to the huddle. There just wasn’t enough time." But was there enough to time to get a snap off, with Romo diving forward to the middle of the hash marks, then get the timeout? It appeared to be the case, but Bailey wanted no such excuse after the game. "Being on the hash mark makes no difference," he said. "My job is to make the kick. If the hold is on the hash, I’ve got to still make the kick. If you’re always hoping for the middle of the field, you aren’t going to be kicking very long." But while Bailey blew off the advantage of kicking from the middle of the field, his long attempt was extremely tricky due to the windy conditions. The wind was swirling inside the bowl, and although not necessarily against him, there was a crosswind involved. He had plenty of foot on the kick, just not between the uprights. Garrett’s boss, Jerry Jones, backed the decision to let 20 seconds escape at the end of the game. "I wanted the kick right there rather than take the risk of attempting to get more yards," said the owner-GM. But even as Jerry admitted, it was a "sickening" kind of loss. The Cowboys’ offensive line totally manhandled a once proud Ravens’ defense, paving the way for 227 yards rushing, the most ever allowed by this defense. And much of the pounding was done by, yes, Felix Jones (he lives, he lives), because of a foot injury to DeMarco Murray that took him out for the second half. Garrett went an unheard-of four deep at running back, with third stringer Phillip Tanner heavily involved, and even rookie Lance Dunbar, signed off the street last week, getting a carry that went for 11 yards. The Cowboys game-planned the run after the Ravens had been plowed under by the Kansas City ground attack a week ago. It worked incredibly well, but not for a win. And here we go again. Garrett has one dumb football team. The penalties were immense (13 for the Cowboys) and some were very questionable, but heavily penalized, dumb teams normally end up on the short end of the officiating. Once again, a special teams coverage breakdown also factored into this loss, with Baltimore’s Jacoby Jones returning a kickoff untouched for 108 yards and a touchdown, tying an NFL record for the longest runback. And even with Bryant repeatedly making tough, productive catches, he still muffed the biggest throw of the game. In the final minutes, after Romo made a gutty 120-yard drive (including 40 yards in penalties), the Cowboys had to go for two points and a tie game after the touchdown catch by Dez. The 2-point throw was right there for Bryant. He flat missed it. The Cowboys, however, recovered the onside kick that led to the missed field goal. The Dez drop, however, low-lighted a frustrating end to a frustrating afternoon and a frustrating loss. Also frustrating were the 20 seconds the Cowboys will never get back. 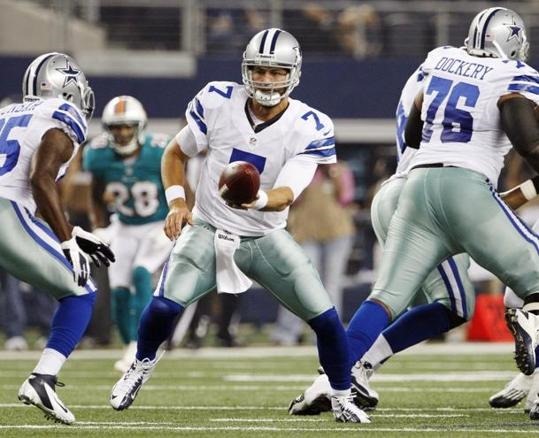 The Dallas Cowboys amassed 481 yards of total offense, the most since gaining 511 against Tennessee (10/10/10). Among Dallas’ 481 yards of total offense were 227 rushing yards, the most since racking up 294 against St. Louis (10/23/11). 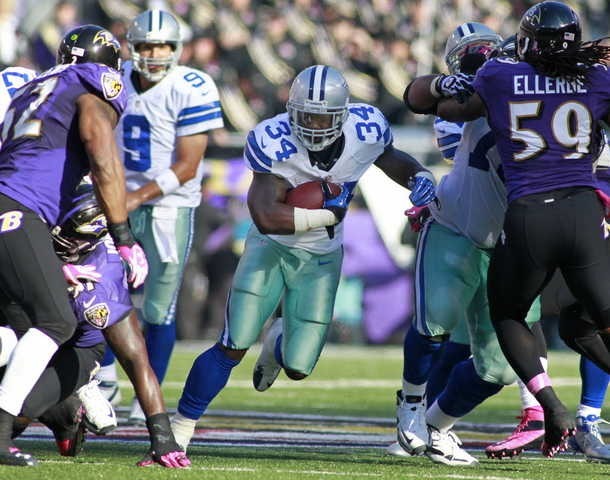 Dallas’ 227 rushing yards were the most ever given up by the Baltimore Ravens. The Cowboys had 42 rushing attempts today, the most since running 46 times at Indianapolis (12/15/10). Dallas ran 79 plays today to tie the most plays in a single game in franchise history. The first time the Cowboys ran that many plays was at Green Bay (11/12/78). The Cowboys had 30 first downs in the game to tie the second-most in a game in team history. The club record is 32, accomplished against Minnesota (11/26/98). The last time Dallas had 30 first downs was at Cleveland (9/7/08). Alex Albright made the first of his career, starting in place of Anthony Spencer (chest). Dez Bryant caught a career-high 13 passes for 95 yards and a pair of touchdowns today. Bryant’s two touchdown receptions today were his first of the season and gave him 17 for his career. He passed Golden Richards and tied Dan Reeves, Bill Howton and Mike Renfro for 17th on the team’s all-time touchdown receptions list. Lance Dunbar made his NFL debut and had his first career carry for an 11-yard run. Felix Jones’ 22-yard rushing touchdown in the first quarter today was his first rushing touchdown since taking one in during the 2011 season opener at the N.Y. Jets (9/11). It was his longest rushing touchdown since he had a 73-yarder in the Divisional Playoff Game against Philadelphia (1/9/10) and his longest of the regular season since a 49-yarder against Philadelphia (1/3/10) one week earlier. 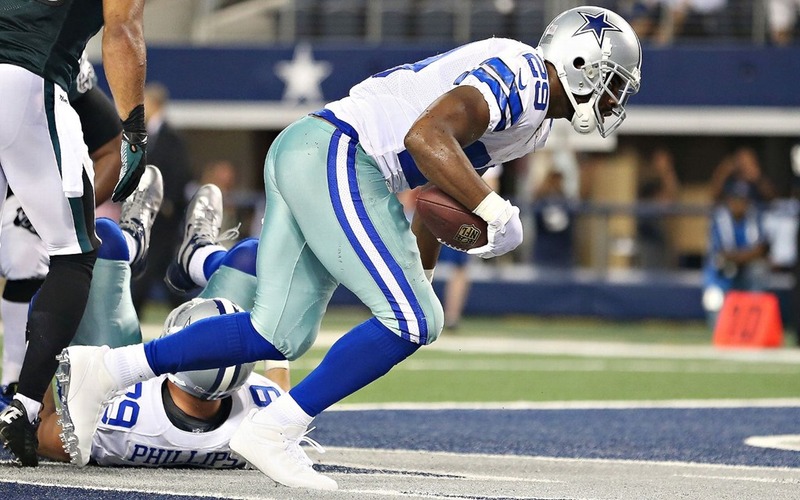 DeMarco Murray rushed 14 times today to give him 237 career rushing attempts. He passed Daryl Johnston (232) for 25th in Dallas record books. Murray rushed for 93 yards today to up his career rushing yards total to 1,227. He passed Tashard Choice (1,139), Sherman Williams (1,162), Preston Pearson (1,207), Don Meredith (1,216) and Timmy Newsome (1,220) for 18th in franchise history. Among Murray’s 93 rushing yards today were 72 in the first quarter (on eight carries) for the seventh-most first quarter rushing yards in franchise history. Tony Romo’s two touchdown tosses today gave him 156 career touchdown throws. He passed Danny White for second place on the Dallas Cowboys all-time touchdown pass list. The Dallas Cowboys had a chance to steal a victory in the final seconds but Dan Bailey’s 51-yard field-goal attempt sailed wide-left. 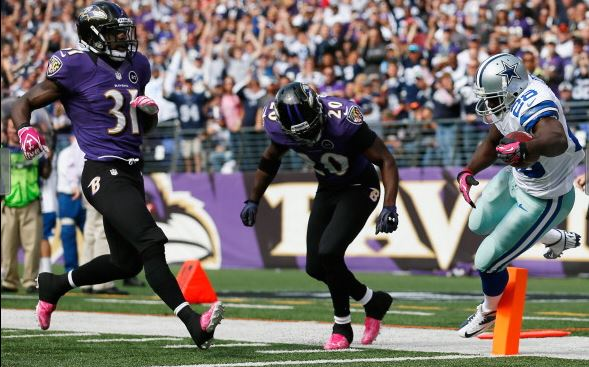 Here are my five thoughts on the Cowboys’ 31-29 loss in Baltimore on Sunday. 1.) The pre-snap penalties throughout the game and time management on the final drive was out of control. It wasn’t just the number of penalties but it’s when they occurred. In several red zone and third-down situations, false start calls stalled drives. That shouldn’t happen in Week 6. I’m not sure a team can win in a hostile environment when they’re making so many mistakes before the ball is snapped. Most of the blame goes on the players that committed the infractions but coaching and game-planning isn’t doing them any favors. Last week, Cowboys offensive line coach/offensive coordinator Bill Callahan said there was talk of simplifying the offense so Tony Romo didn’t have to do as much adjusting at the line of scrimmage. Ha! That clearly didn’t happen, especially on Dallas’ final touchdown drive. Romo barely got two plays off because of confusion at the line of scrimmage. The way the Cowboys managed the clock on their final drive prevented Bailey from having a closer attempt to win the game. These are four examples of costly pre-snap penalties the Cowboys committed in Baltimore. 1-Early second quarter: Third-and-4 on Baltimore’s 12. Illegal Shift, 5-yard penalty. 2-Early fourth quarter: First-and-10 on Baltimore’s 10. Illegal Shift, 5-yard penalty. 3-Late fourth quarter: Third-and-1 on Dallas’ 29. Jeremy Parnell, false start, 5-yard penalty. 4-Late fourth quarter: Third-and-22 on Baltimore’s 44. Kevin Ogletree, false start, 5-yard penalty. 2.) Yes, the running game looked outstanding, but don’t be fooled. The Ravens aren’t the defense they once were. Fresh off of allowing the Chiefs to run for 214 yards, the Cowboys amassed 227 yards on the ground. Having Phil Costa back at center obviously helped and running behind Tyron Smith and Nate Livings on the left side continued to be Dallas’ best option. DeMarco Murray was dominant early, Felix Jones looked like a first-round pick for the first time this season and Phillip Tanner and Lance Dunbar each filled in nicely. Sorry, I need to see this more often to believe it was all because of what the Cowboys were doing. 3.) Dez Bryant had a costly drop that would’ve tied the game on a two-point conversion, but he still played his best game as a Dallas Cowboy. Bryant caught all five passes thrown his way in the first half and finished with 13 catches on 15 targets. His two touchdown receptions showcased how his physical ability makes him one of the most difficult assignments for any defender. Bryant finished with 95 yards and a pair of scores after not recording a touchdown in the first four games of the year. There’s still a long way to go for Bryant to be a complete receiver, but dropping a two-point conversion pass with a defender draped on his back shouldn’t overshadow what he did before that play. 4.) This loss wasn’t only significant because there was an opportunity to steal a game in arguably the league’s toughest road venue but because of how difficult the schedule lines up over the next four weeks. The Cowboys will not be favored in three of their next four games as they host the Giants before traveling to Atlanta and Philadelphia. Losing three of their next four would put the Cowboys at 3-6, not exactly the recipe for a playoff berth. And Dallas’ current 2-3 mark is much worse historically than had they won and been 3-2. Teams that start 3-2 have a 51 percent chance of reaching the playoffs. Teams that start 2-3 have a 21 percent chance. Not good for a team with a closing window. 5.) My fifth thought is actually a combination of things. Hats off to Jason Witten. He has clearly put his dropped-passes issue in his rear-view mirror. Witten made two difficult grabs during the final touchdown-drive, including a diving catch on fourth-and-long. … How bad will the injury report look on Monday? Already without Anthony Spencer, Morris Claiborne exited with a left knee injury, DeMarco Murray barely played in the second half after sustaining a foot sprain and Sean Lissemore had his day ended with an ankle sprain in the first quarter. … Joe DeCamillis’ special teams unit isn’t the worst in the league but it’s also not very good. After the Cowboys cut Baltimore’s lead to 17-13, DeCamillis’ bunch allowed Jacoby Jones to return the ensuing kickoff untouched for 108-yard touchdown. The Cowboys get very little out of their own punt and kick returns, showcased by averages that rank among the NFL’s worst. They also allowed a punt to be blocked and returned for a touchdown in Seattle. IRVING — The Dallas Cowboys are disappointed with their 2-2 start. But there is nothing they can do about that now. So cornerback Brandon Carr said the Dallas Cowboys have let go of the first four games and returned Monday after their bye focused on the second quarter of the season, which arguably features the toughest stretch of the year, with three of the next four on the road. "Guys are just eager to get out there and to have fun, just to get out there and mix it up a little bit," Carr said Monday. The upcoming schedule takes them to Baltimore on Sunday, Carolina the next, home against the New York Giants, and then to Atlanta. With a road game at Philadelphia the following week, the Cowboys have four of the next five on the road. "We have to focus on the now, and the now is the Baltimore Ravens," he said. "This week, getting ourselves prepared both mentally and physically for a 60-minute dogfight, and that’s what we’re going to get." The best news coming out of last week’s bye is that Pro Bowl nose tackle Jay Ratliff and a number of other injured defenders are ready to return. The others include linebacker Anthony Spencer, who missed the Chicago Bears game with a strained pectoral muscle, and defensive end Kenyon Coleman, who missed the past two games with a hyperextended knee. Ratliff missed the first four games with a high ankle sprain. He practiced on Monday and should be ready to make his season debut against Baltimore. "Getting Jay back is like getting three guys back," defensive end Marcus Spears said Monday. "In the nickel packages, in the base packages and then teams actually game plan for Jay Ratliff." Center Phil Costa practiced Monday for the first time since going out with a back injury on the first series in the season opener against the New York Giants. He worked with the first team and appears ready to step back into the starting lineup for Ryan Cook, who replaced him the past three games. Though Cook missed practiced on Monday because of a lingering hamstring issue, Costa’s possible return to the lineup could give the line comfort and improve the communication, hopefully resulting in better protection and few false starts. 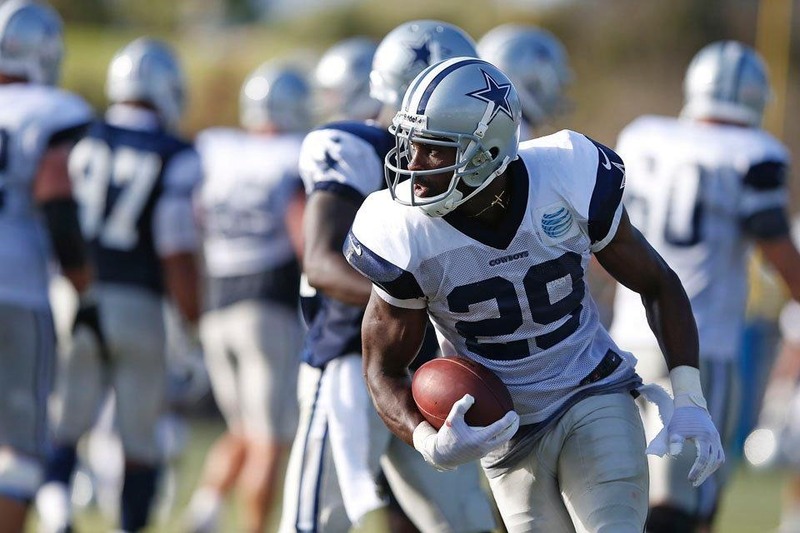 The Cowboys signed former North Texas running back Lance Dunbar to the active roster from the practice squad and signed receiver Raymond Radway to the practice squad. Dunbar, an undrafted free agent who played in high school at Haltom, was added to help the kickoff return unit. He will also be a gunner on punt coverage, but his biggest role is on kickoff returns where Felix Jones ranks 24th in the NFL, averaging 21.5 yards per return. The Cowboys’ average starting field position on kickoff is the 19-yard line, ranking 31st in the league. "They just want somebody to make plays, get past the 20," Dunbar said Monday. "I think I can do that. This is my time. I can’t let it pass." Lance Dunbar finally will get his chance to play. The Cowboys promoted him from the practice squad Monday to fill their 53-player roster. Dallas released cornerback LeQuan Lewis, a special teams standout who they brought in to help against returners Leon Washington and Devin Hester, last week. "We’re going to bring Dunbar up and give him a chance just to contribute as a teams guy and also on offense when necessary," Cowboys coach Jason Garrett said Monday. 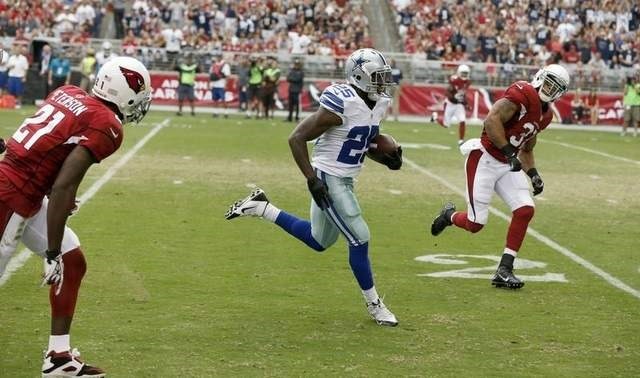 The Cowboys nearly called up Dunbar before the season opener against the Giants. Dunbar, North Texas’ all-time leading rusher, ran for 106 yards on 18 carries in the preseason and caught three passes for 11 yards. Dunbar could be a possibility on kickoff returns. He had three punt returns in the preseason but did not handle any kickoff returns. Felix Jones has averaged 21.5 yards on kick returns this season, and the Cowboys rank next to last in average start after a kickoff (19.2 yard line). "He’s a quick guy," Garrett said. "He’s shown that he can be a good gunner and make some plays. He’s very aggressive and active. So want to give him a chance to do that. He’s also done some returning for us as well. So just wherever he’s needed. We’ll give him some work in practice at the different spots and see how he responds." 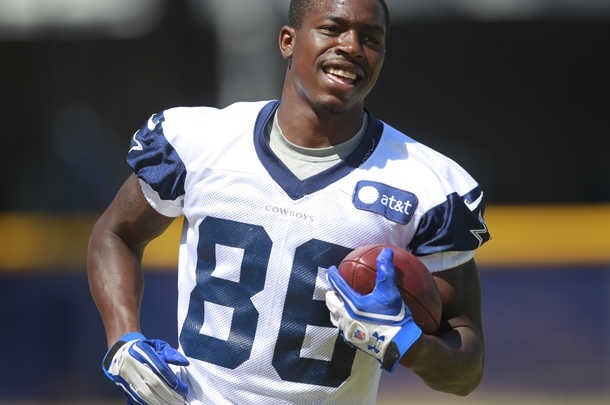 The Dallas Cowboys also brought back receiver Raymond Radway, signing him to the practice squad. Radway spent last season on injured reserve and was among the team’s final cuts this year. Danny Coale has a hamstring injury, necessitating the move for practice purposes. Wide receiver Raymond Radway is “more healthy now,” one reason the Cowboys have brought him back. The team announced today the signing of Radway to the practice squad and the promotion of running back Lance Dunbar from the practice squad to the active roster. Miles Austin, Kevin Ogletree and practice squad receiver Danny Coale worked with trainers in practice Monday. In preseason two years ago, as an undrafted rookie, Radway caught six passes for 91 yards and averaged 25.4 yards on four kickoff returns. He was set to make the 53-man roster. But he suffered a broken leg with three seconds left in the final preseason game and spent the rest of the year on injured reserve. He had one kickoff return for 26 yards. Patricia Jones says that her son, Lance Dunbar, first told her when he was 12 that he wanted to play in the NFL. In the family’s native New Orleans, that meant a standout career at a local high school, followed by a short drive west on I-10 around Lake Pontchartrain to Baton Rouge to play for LSU, and finally, hopefully, a contract with the New Orleans Saints. That’s the dream anyway, but few young men are talented enough or lucky enough to make it happen. Dunbar’s path to the NFL did take him through his local college and his local NFL team. But it was the University of North Texas and the Dallas Cowboys, not LSU and the Saints. You see, New Orleans isn’t home to Dunbar anymore. It hasn’t been since Hurricane Katrina. Even seven years later, the mention of “Hurricane Katrina” resonates mightily with those who lived through it. The violent storm swept through the Bayou and by the time the disaster was over, the levees were broken, more than 1,000 people had died and thousands more hade fled, never to return. Opening day of football season was less than a week away when it became apparent Hurricane Katrina would hit New Orleans in August 2005. Dunbar had just played in his Jamboree game for De La Salle, the equivalent of a preseason scrimmage. De La Salle was one of the best prep schools in the city, a private school that excelled both academically and athletically. Dunbar was good enough to play varsity athletics in the eighth grade and had already put in two years on both the varsity football and basketball teams. He entered the 2005 season as a starting safety and a backup running back. There is little doubt in Jones’ mind that had the family stayed in New Orleans, Dunbar would have found his way to a Division I school and, perhaps, the NFL. By the Saturday before landfall, Jones knew it was time to get out of New Orleans. She packed up what she could and took the entire family to a Red Cross shelter in Hazelhurst, Miss., about two hours from New Orleans. The shelter was the family’s home for the next two weeks. From there, Jones and her family watched Katrina come and go, and watched the levees hold, then break. Because Jones heeded the warnings, her family didn’t have to live through the hell that became New Orleans in the days after Katrina. But she faced the same decision as others in the wake of the storm. New Orleans had been home. De La Salle was a great school for a gifted athlete and smart kid like Dunbar. Plus, Jones admits, their home didn’t suffer as much damage as others in New Orleans. The family could have returned, but watching her city descend into lawlessness and despair was too much. She said she never really entertained the thought of taking her family back. The storm provided a unique opportunity to start over. Jones could have moved the family anywhere. One day she received a phone call from one of Lance’s former youth coaches (J.R. Sheppard) in New Orleans, who was now living in Haltom City, a suburb northeast of Fort Worth. He encouraged her to move the family there. Jones worked in a hospital system and was able to transfer from New Orleans to North Hills Hospital in North Richland Hills. So, sight unseen, Jones moved her family and some friends – 13 in all – to Haltom City that fall. Jones’ friend set up a hotel for the family near the school so Lance and his siblings could start school as soon as possible. It didn’t take long for the family to make its final decision on where to stay. The hotel was a temporary residence. When the family did find its first permanent residence, its location was of little surprise to anyone who knows Lance. It was right behind Haltom High School’s practice field. Clayton George found himself in a unique position to relate to Dunbar when he arrived as Haltom’s head coach in the spring of 2006. George had just spent a couple of years as the head football coach at Dallas Hillcrest, his first head-coaching job after leaving Southlake Carroll. Hillcrest became a hub for families displaced by Hurricane Katrina. He coached several players from New Orleans and heard their stories about the storm and the tragedy that came afterward. George inherited a player with unique talent as both a rusher and a receiver. Dunbar joined Haltom midway through the 2005 season and gained 640 yards and scored four touchdowns. In his one season at Haltom, George says he did everything possible to put the ball in Dunbar’s hands. That translated into 1,100 yards rushing and 14 touchdowns, along with 750 yards receiving and two more scores in 2006. George spent just one year at Haltom because, shortly after the end of the 2006 high school football season, he accepted a job as the wide receivers coach at the University of North Texas offered by his former Southlake boss, Todd Dodge. But in less than 12 months, Dunbar and George had connected on a personal level. George got to know not just Dunbar but Jones and the rest of Dunbar’s extended family. George and Dunbar still talk regularly and the family invited George to their home on the final day of the NFL Draft. George was there to watch the dream come together for the player he calls his “favorite” of any player he’s coached. Their relationship extends beyond Dunbar’s obvious talent. When George left for UNT, he told Dunbar he would come back for him. Dunbar finished off his career at Haltom in 2007 with a 1,200-yard season. Oklahoma State wanted him. Colorado wanted him. So did Virginia. But Dunbar chose North Texas. So Dunbar signed with UNT, a decision that admittedly made Jones happy. She and her husband went to every game. So did Lance’s father, Lance Dunbar Sr. Denton, Texas is a heck of a lot closer to Haltom than Stillwater, Okla. And it was proof that Texas was now home. The test? The day he signed with UNT, guess who called the Mean Green’s newest recruit? Dunbar wanted to play right away, and he did. When he received his first start for the Mean Green, he torched Louisiana-Lafayette for 224 yards and four touchdowns. By the time he ended his UNT career, he had torn up the Mean Green record book, which was once the sole property of Patrick Cobbs. Dunbar finished with 4,224 yards, making him the program’s all-time leading rusher. Additionally, he is now UNT’s all-time leader in touchdowns (49), all-purpose yards (5,375), 100-yard rushing games (21), points (294) and rushing touchdowns (41). He was also the only Mean Green runner to have three straight 1,000-yard seasons and became just the sixth back in FBS history to compile 4,000 rushing yards and 1,000 receiving yards for a career. He earned All-Sun Belt first-team honors twice and Sports Illustrated named him honorable mention All-America twice. He ended his tenure in Denton with a crescendo. He rushed for 313 yards against Middle Tennessee in a game played in a cold, driving rain for most of the contest. That night he broke Cobbs’ career rushing mark with Cobbs in attendance. But that wasn’t enough to entice NFL teams to draft Dunbar in April. Had one done so, he would have become just the second Mean Green player to be drafted in the last 16 years. But had one done so, he might not have ended up in Dallas. Dunbar did not earn an invite to the NFL Scouting Combine in Indianapolis in February, so his one opportunity to impress NFL scouts came in March at the Mean Green’s pro day at Apogee Stadium. The Cowboys were among the teams in attendance, as was current UNT coach Dan McCarney. George heard about it later from a friend, Cowboys offensive assistant Keith O’Quinn. Draft day was quite the party at the Dunbar house, even though there was no guarantee Dunbar would be drafted. George says the house was packed with more than 60 relatives and friends, some from Haltom and others from New Orleans. Late in the draft, Dunbar received a call from the Cowboys letting him know they were interested in signing him as a free agent, if no one drafted him. “By the time the draft ended the process was already rolling,” George says. So does Dunbar have the goods to stick with the Cowboys? Well, George believes that if anyone can overcome the long odds that face any undrafted free agent, it’s Dunbar, who says he loves competition. McCarney compares Dunbar to a player he coached while an assistant at Iowa, Ronnie Harmon. 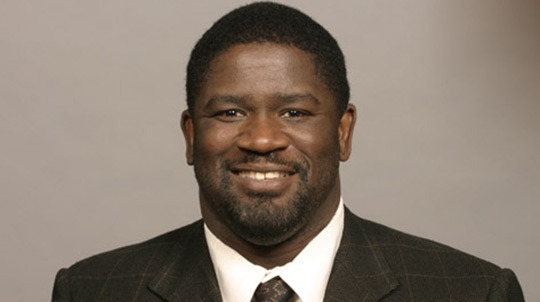 Harmon carved out a 12-year NFL career in which he gained nearly 9,000 yards. McCarney says Dunbar has similar strength, hands and versatility. The Cowboys are intrigued. Peete likes Dunbar’s pass receiving skills, decision-making and quick adjustment to learning NFL schemes. Dunbar spent plenty of time with the second team offense in the ramp-up to training camp. The man Dunbar replaced in the Mean Green record book, Cobbs, was an undrafted free agent coming out of college. Before spending 2011 on New Orleans’ injured reserve list, he played five seasons as a backup running back and special teams star for several teams, including Miami, where he served as a captain in 2010. What lies ahead for Dunbar? We’ll just have to wait and see. But his circuitous path in life and to the NFL has proven he can overcome just about anything. This story originally appeared in Dallas Cowboys Star Magazine. For subscription information, please click here. 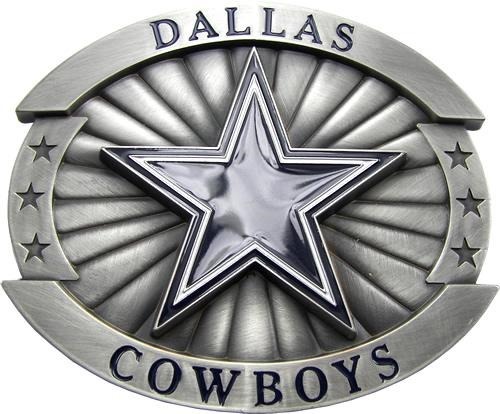 IRVING, Texas – While the players and coaches will be off most of the weekend here during the bye, the Cowboys are still trying to churn the bottom of the roster. There is an open roster spot, and the Cowboys have worked out two players now this week after former receiver Raymond Radway had a workout Friday at Valley Ranch. Radway has spent the last two training camps with the team and all of last year on injured reserve after he broke his leg on the final play of the 2011 preseason. Radway returned this season and just didn’t show the same burst during training camp and the four preseason games. He worked out for the scouts and selected coaches on Friday. Radway does have practice-squad eligibility so there is a chance the Cowboys could sign him to the squad and call up another player to the active roster. The current practice squad consists of receivers Danny Coale and Tim Benford, defensive tackles Robert Calloway and Ben Bass, guard Ron Leary, fullback Jamize Olawale and running back Lance Dunbar, who actually went on a road trip to New York to start the season with the plan he would be called up to the roster. That never materialized but Dunbar is someone with speed and quickness that could bolster the special teams. Earlier this week, the Cowboys worked out former cornerback Bryan McCann, although it’s unlikely he will be re-signed at this point. EAST RUTHERFORD, N.J. – In just another example how the 53-man roster is never final, the Cowboys made a late roster move this morning, just a few hours before the season opener. 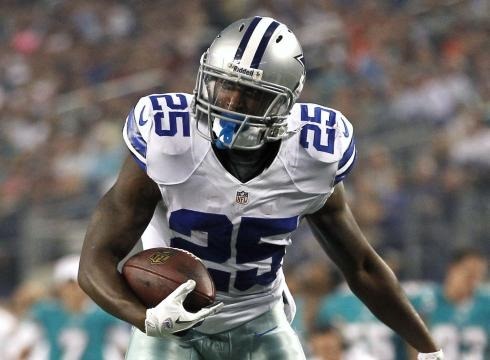 The club signed rookie tailback Lance Dunbar to the active roster, likely meaning the undrafted rookie from North Texas will indeed play tonight against the Giants for his NFL debut. To make room for Dunbar, the Dallas Cowboys released tight end Colin Cochart, who was just claimed off waivers from the Bengals last week. Cutting Cochart doesn’t exactly indicate that Jason Witten will play Wednesday. The Cowboys are sticking with “game-time decision” for Witten, who visited his doctor for the lacerated spleen injury on Tuesday. Witten flew up after the team but is now in New York with his teammates. Dunbar, who missed the first two preseason games with a hamstring injury, had an electrifying end to the preseason with a 105 rushing yards, including a 59-yard touchdown run against the Dolphins. He impressed the Cowboys with his speed and quickness all throughout the summer. Dunbar will likely play mostly on special teams, including kickoff return. However, Felix Jones is expected to be the primary return specialist, but Dunbar could get also be back as a side returner. When the Cowboys trimmed the roster down to 53 last week, Dunbar and his college teammate Jamize Olawale, survived the first big cut, although the roster remained at 54. In the end, the Cowboys cut both Dunbar and Olawale and re-signed them to the practice squad, which now has seven players.